Thanks to the progressive thinking of Quinte Conservation and the Belleville City council, dog owners in the Quinte area now have a place to legally let their dogs exercise off leash. There are almost five hundred designated off leash areas in Canada, but Belleville is the first community to Eastern Ontario to establish such an area. Before the "Pooch Path" and the "Belleville Dog Park" were constructed, many dog owners used city parks to exercise their dogs, often causing problems with non-dog owners who like to use the parks for jogging, bicycling, and roller blading. As well, if a dog is running off leash, they may make a mess in the field off the path which is difficult to find and clean up (especially in the snow). An off leash area solves both these problems. 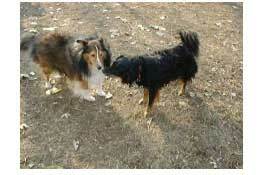 Friendly dogs and their owners can walk and socialize with each other without worrying about bothering non dog owners. The "Pooch Path" is an unfenced dog trail at the Quinte Conservation area at the corner of Wallbridge-Loyalist Road and Highway 2. The Belleville Dog Park is a three acre fenced facility in East Zwicks park. See our web site for directions to either area. The "Pooch Path" opened in August and has attracted a group of regular users who enjoy hiking the trail with their dog. The Dog Park opened in October and has become a favorite meeting place for many dog owners in Belleville. Both areas have been a TREMENDOUS success, attracting five times the number of visitors as first anticipated. The Quinte region is truly fortunate to have these two facilities. The Pooch Path now has a welcoming sign listing the trail rules. We have also installed a "digester" and provide biodegradable bags at the trail entrance. Pooch Path brochures were designed and printed by Terry Sprague of Quinte Conservation, and are available at the entrance as well. Please be sure to keep the trail clean by picking up after your dog. Only put the biodegradable bags in the digester, not plastic bags. Since no one walks in the fields off the trail, it is acceptable to move any droppings off the trail into the field, but do NOT throw your plastic bags in the field. This trail was built to give dog walkers a place to walk with their dogs in the winter rather then on the cross country ski trails. The Pooch Path will be plowed after a heavy snow. PLEASE do not use the main trail during cross country skiing season. Quinte Conservation built this trail for us at their expense to enhance their ski trails and let's live up to our part of the bargain. On October 20, members of the Dog Park Association gathered to do a final cleanup of the park, and shortly after, the gates were opened to happy dog owners and their pets. During the first month of operation, more than 2,000 dogs and owners have visited the park with very few problems. Members of the Quinte Dog Park Association wear an identifying badge, and help to ensure that all users understand and follow the rules. The park is remarkably clean considering the number of dogs using the park daily. Please be sure to clean up after your dog. Since it is a large park, sometimes you may not see your dog make a mess or be able to find the spot. Therefore, if you see ANY mess, pick it up, since someone else may be picking up after YOUR dog. Please use the entire park. Because it is so new, many people are congregating just inside the gate to visit and watch the dogs. This kills all the grass in this area, and since most dogs stay with their owner, there is a large group of dogs which is intimidating for new dogs entering the park. Because of the large number of dogs, and for health reasons, we no longer supply water. We left the bowl however, that you can use if you bring water for your dog. We hope to one day be able to have a water faucet brought into the park. Also, please bring your own plastic bags and perhaps some extras for those who forget. We now have more than 130 members. Thank you for your support. With your help, we can continue to keep the park safe and clean. Shortly, we will be erecting a sponsor board on which we sell advertising to raise funds. We must re-pay the city for the cost of the fencing, and once that is done, we plan to improve the dog park by adding lights so the park can be used by those who wish to exercise their dogs in the evening, and to bring in water. We also need some ground cover for the pooch path, since the trail is so heavily used. I will be sending each member a package outlining our sponsorship options. Please make copies of this package, and give them to any businesses you know who might be a potential sponsor. On November 25, we will be selling dog related items at the Gift Show and Sale at Bridge Street United Church. A lot of work by our members has gone into providing a wonderful display of items. Kudos to the fine work these ladies have been doing, and to their dogs who have had to act as models in order to get the scarves just right. Early in the spring, we will be having a GIGANTIC yard sale in the Quinte Computer parking lot. We will be asking all our members for donations to this yard sale. Sheba & Pepper see eye to eye now!